Baldwin’s pending health and Clark’s pending wealth complicate the Seahawks’ plans for Wilson’s extension. He deserves top of market, but how much is too much? Sweep your eyes across the Seattle spring sports landscape, and prepare to have them spinning spirals. Not long after the Washington Huskies won a game in the NCAA men’s basketball tourney for the first time since the Great Permian Die-Off, the Mariners and Sounders started seasons nearly spotlessly, while the Seahawks in their off-season are running scared. Hey, U.S. politics are upside down. We should be used to disruption by now. Regarding the Seahawks, lord and master of regional sports, the descriptor “running scared” might be a tad dramatic. But anytime the career course of the franchise quarterback reaches a narrow mountain switchback, looking over the cliff’s edge is as irresistible as it is scary. As you likely know, QB Russell Wilson’s self-imposed deadline to complete negotiations for a contract extension is Monday. Speculation is intense, facts are few. The chances of him remaining a Seahawk near-term seemed good no matter what, since he’s under contract for 2019, and then the Seahawks can afford to pay him under single-year franchise tags in 2020 (about $30 million) and 2021 (about $36 million). But since news broke of Wilson’s deadline — the Seahawks have known since January that he didn’t want extension talks dangling over his head for months — a couple of developments have ratcheted up the tension, underscored by an incontrovertible and inconvenient (for Seahawks fans) truth. At 31 in November, Wilson — right here, right now, ahead of the draft April 25 — is at the apex of his athletic value. Healthy, experienced, smart, successful, a proven leader and fourth-quarter master coming off the most efficient season of his career, Wilson as a talent would be coveted by 78 of the other 31 teams. OK, he isn’t as fast as he was. Make it 3o of 31 (Kansas City with Patrick Mahomes is out). But any club would have to pay him eventually as the game’s most expensive player, at around $35 million a year. So that would knock out one or two more teams. 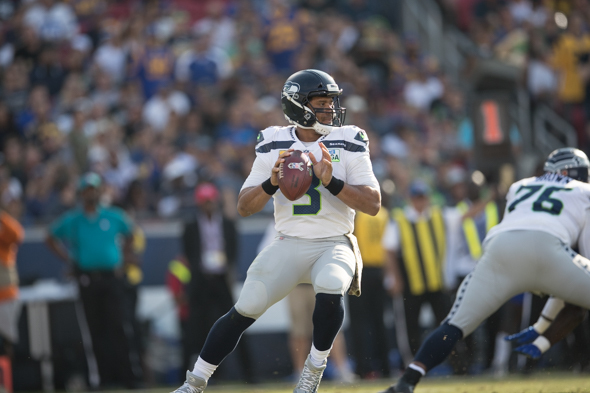 Besides the robust market for Wilson’s services, the Seahawks recently have had to entertain the notion of replacing two other star players, WR Doug Baldwin and DE Frank Clark. Coach Pete Carroll told reporters last month that Baldwin was booked in April for surgery to repair a sports hernia, apparently his third or fourth surgery of the off-season, including shoulder and knee problems. Entering his ninth pro season, and 31 in September, Baldwin’s 192-pound body has had a battering. “There’s never been anybody that’s tougher and more able to come back from whatever challenges have been,” Carroll said of Baldwin. “He’s been extraordinarily adept at figuring out how to return from, and understand the circumstance of, being banged up. So if he could, he will. Regarding pending free agent Clark, the Seahawks used the franchise tag in March to secure his services for 2019 at $17 million, hoping to work out a long-term extension before a July 15 deadline imposed by NFL rules. But after that, the Dallas Cowboys set afire the market for edge rushers by giving their own DeMarcus Lawrence a $105 million deal over five years, with $65 million guaranteed. Since Clark is a year younger than Lawrence and had better pass-rush numbers in 2018, it figures that Clark rates a slightly better deal. Which is great for him, grim for the Seahawks. It’s why rumors swirl about the Seahawks considering trading Clark. Because in addition to Wilson and Clark, the Seahawks are also needing to extend the contracts of two vital defenders, LB Bobby Wagner, 29 in June, and fast-improving DT Jarran Reed, 27 in December. While it is true that all NFL clubs must make similar difficult choices, the Seahawks are likely unique right now: They seek to offer extensions simultaneously to players who are considered top-five at two vital positions, quarterback and linebacker, as well as accommodating a premier young pass rusher at the most important position besides QB. Plus, they have a long-term keeper in Reed. This moment arrives ahead of a draft in which they have a club-record-low four draft choices with which to patch holes. All of which more than justifies Carroll and general manager John Schneider running scared. They are peering over cliff’s edge, wondering if they can survive the crash of trading Wilson. Wilson’s apex value means they can fix multiple holes at once, and perhaps get a veteran QB to make the transition quicker. But if they draft a rookie QB, they return to that pivotal business sequence in 2012: Drafting a franchise quarterback who plays on a cheap rookie deal, allowing them to build a roster that reached consecutive Super Bowls. To make the consequences plain, here it is in a sentence: In 2019, the Chiefs have a cap hit for Mahomes of $4.4 million. The cap hit for the Packers with Aaron Rodgers is $26.5 million. If I were the Seahawks’ dons, I’d do the easier thing: Stick with what I know in Wilson, franchise-tag him twice, then see after 2021 whether something more than microbial life still exists on the planet. But I don’t know what kinds of players/picks are being offered right now for Wilson that might get the Seahawks back to the future. They might choose to do the hard thing, for a more optimistic future. It’s business, DB either makes it back healthy or not. No worries. Trade Clark and cobble together a patoon of edge rushers/run stoppers. Keep Russ, aka the franchise. Or, trade Russ and play/pray for wild card game and build the future. I prefer, roster turmoil, it’s the business. What’s Russ’s value during or after franchise tag is spent? Oh, keep Wagner, aka the anchor on defense. You prefer roster turmoil? You’ve come to the right sport. You must love the turnover in college ball. Never buy a player jersey in either sport unless your dog bed needs a blanket. I accept roster turmoil for what it is, high drama for management, fans but not so much for me. My Willie Mays, Bart Starr, Bill Russel days of youth have been spent. Maybe Wilson isn’t a Twelve and would rather play elsewhere. Is Baldwin’s sport hernia surgery or timing a tactic? If Wilson stays, Baldwin is gone. Wilson likes it here, but sentiment won’t be a factor. He can afford to move the fam. I don’t like these stress-inducing posts, but thanks for more keen insight. But did I read this right, Art? Are you saying pass rusher is the second most important position on the team? Can you elaborate? Is that conventional wisdom? I’m not saying it’s wrong, and Clark is great, but I’d think he’s more replaceable than some other positions (beyond QB). Nearly every team and observer I’m aware of considers edge rusher the No. 2 value behind QB, because it’s obvious — the rusher is the No. 1 antidote to the QB. With the prevalence of play action and the short-pass game, the left tackle’s importance in protecting the blind side has diminished. Russ Wilson + Mark Rodgers = no contract by Monday. Unless the Hawks are planning a sign and trade. In addition to the guys they really need to sign I would guess John and Pete would not want to risk a clubhouse issue. If Russ gets ‘the farm’ then others get less or get dealt. Players are aware of this. You think the club house doesn’t understand that QB’s get paid? You think the club house and fan base will be happy if Wilson is traded? It’s easier to replace Clark than it would be Wilson…..
We’re talking about a clubhouse that HAD a problem, as you may recall. And they know there is only so much pie to go around. Hundreds of thousands and indeed millions disappear when a contract is WAY over the top. We’ll see what the numbers actually are but if we’re talking about $140 mill over four years with everything guaranteed, then yes, I think there will be a problem or two. The problem in ’19 is loss of quality personnel, not jealousy. The Legion of Boom was somewhat jealous of Wilson, but that happens with every team that has a star QB. It’s true that Wilson is the rarest of gems. But we can’t know yet how close the Seahawks can come to his productivity equivalent. All we know is Wilson vs. not-Wilson. I don’t think that RW getting top of market would cause friction. He’s proven he’s earned it. But losing quality players primarily for QB salary reasons is a bad outcome, no matter how it’s spun. Losing Seasons these team(s) have had since these QBs were drafted or join their new teams. 6-Matt Stafford (Detroit), Jay Cutler (Denver/Chicago and Miami) and Eli Manning (Giants). 5-Carson Palmer (Bengals/Raiders/Cardinals), Alex Smith (49ers/Chiefs/Redskins) and Cam Newton (Panthers). 4-Ryan Tanneyhill (Miami), Aaron Rodgers (Green Bay) and Derek Carr (Oakland). 3-Phillip Rivers (Chargers), Andy Dalton (Bengals), Matt Ryan (Atlanta), Peyton Manning (Colts and Broncos). 1-Tom Brady (Pats), Jared Goff (Rams), Carson Wentz (Philly), Mitch Trubisky (Bears), Joe Flacco (Ravens) and Andrew Luck (Colts). 0-Ben Roethlisberger (3 .500 seasons) and Russell Wilson. Russell Wilson is the ONLY QB in the NFL who in multiple years with that franchise has been better than .500 EVERY YEAR since he joined that team. That’s how important he’s been to that team because he is always on the field, produc ing at a Hall of Fame level and the team is always in the playoff mix. Joe Montana, Steve Young, Kurt Warner, Terry Bradshaw, Troy Aikman, Joe Namath, Len Dawson, Bob Griese or Fran Tarkenton can say that. Besides Wilson, ONLY Roger Staubach can say that. That’s why he is worth the damn money! A game with 22 players on the field every play diminishes the influence of any single player, even a QB. A premium QB is the greatest single asset to success, but it does not follow that a premium QB can prevent a losing season. While I agree that Wilson is a top-five QB, in an NFL governed by a salary cap, it can be argued that one of his greatest assets was the smaller salary he drew as a third round pick that allowed the Seahawks to populate the roster with better players. You can run down the halls of the Hall of Fame, put Wilson’s stats and accomplishments next to any QB and they not only match up, they blow 90% of their’s away. Do you think Brees, Rodgers, Manni g or Brady could make the incredible plays Wilson made in that Minnesota playoff game, that crazy play against Arizona or that 2 point conversion against Green Bay ON THEIR OWN like Wilson does routinely? Without that 2 point conversion he made ON HIS OWN, they would have lost that game 22-20 because they gave up the FG that forced OT. Russell Wilson as a talent and leader doesn’t take a backseat to anyone that has ever played that position. If he was white doing what he does, he would be crowned the best. Brady is more accomplished as a QB but doesn’t come close to Wilson in skills. Rodgers, Brees, Roethlisberer and Manning wishes they had his talent. Trading Wilson for high draft picks make little sense for a team noted for missing the easy layups. Correct me if I’m wrong, but the only outstanding Seahawk first round draft choice since Steve Hutchinson in 2001 was Earl Thomas in 2010. So at that pace maybe another good one will show up in 2020. Or not. It might make better sense to trade Wilson for a bushel of third, fourth and fifth round picks. That seems to be their actual level of drafting competence, and if you get enough chances nobody will notice a few misses. Can’t argue with your first-round skepticism. Okung was also a first, but I get your point. If a trade happens, the Seahawks might take a 1, a 2 and a 3. Or a vet D-line rusher. Was there ever a better name than Myron Floren? The idea of rolling the dice and repeating the 2012 move is interesting. The idea of a hiccup instead of a super bowl appearance isn’t. But that’s how dice work, some times you hit the right numbers, some times you don’t. and of late the Seahawks are something to watch until college basketball cranks up in November. I’m happy to see that the social justice crap has been sidelined, but I realized how little pro football meant. It’s all about the bucks, big bucks. If Wilson is traded I won’t be surprised, nor will I care. He’ll be taken care of regardless of where he lands. Dang! I’m showing my apathy towards pro football. Ken…Next November, take in a game at SPU. Ten bucks for a ticket, free parking and great basketball. There you go. It’s more honest because few care, therefore there’s no money in it. I have no desire to coax anyone into or out of fandom. But I will say if you’re put off by big bucks, how in the world can you support college hoops, the most crooked, corrupt enterprise in sports. Well, next to FIFA. ESPN paid about $7.3 billion over 12 years for rights to the playoff games plus a few others. That would be about $600M per year JUST for said games JUST from one broadcast outfit. If the hint of a delusion remains that college football is amateur . . . . Same thing about college b-ball, especially if you have kept track of various arrests and deals and upcoming trials and hundreds of millions from the shoe/apparel companies alone. In the meantime, Whitman College has a good basketball program. This is probably not going to be a popular post… I dislike just about everything in regards to the Patriots and Tom Brady, but I will say this… Tom Brady is about winning, it’s all he cares about. He’s given his team a “hometown discount” to continue a winning tradition, and he has the SB rings to show for it. He is unique in this regard and I understand that, but boy would it be nice to not have to pay out such a significant portion of the cap for one player. If I were a player, 25 years after my career, I’d have a hard time explaining the home team discount to my grand children and great grand children. On one level, I understand that, and I understand getting paid for the pounding that you take. On another level, grand children and great grandchildren shouldn’t be relying on ol’ granddad Wilson to pay the freight and $15-$20M ain’t chump change either. If they’re quibbling over that, perhaps they shouldn’t get any. Brady’s grandkids will be gloating into their gray years over grand pappy Tom’s SB rings. Not when you’re still making $25M. If Brady can squander that, his grandchildren deserve to shop at the Dollar Store. Brady’s discount is a factor, but so is Belichick’s ruthlessness when it comes to personnel. And as good as Wilson is, he isn’t Brady. Put Wilson in NE system and put Brady behind the OL and systems Wilson had. Brady would be retired already and Wilson would be thriving. I tend to agree, at least that given a way better OL over the past 4 years, Wilson’s stats would have been even better. I also agree that had Brady taken the beating that Wilson has taken, he would not have been the QB that he currently is. I’m amazed at times that Wilson is still in one piece and his durability, all things considered, is maybe his most impressive attribute. What me worry? I don’t share the sense of urgency. Baldwin (one of my favorite players) has until September to get healthy. Clark and Wilson are under contract for 2019, and Wilson can be extended beyond. Extend Wagner, have a good draft (draft a QB), hope for 16 games from Dissly, re-aquire Kearse, and have a successful season. Glad you’ve figured it out. But reading between the lines, Carroll is concerned about Baldwin. And the edge rusher market just blew up. I don’t think that either is a lock to be here and ready in Sept. Spoken like a true purple. The Dardanelles are but a leisurely stroll. – Sign RW for $35m to a 4 or 5 year contract. He is tied with Brady for the career best TD/INT ratio of 3.1/1 and last year was a ridiculous 5/1. I speculate it’s not the money but years they are haggling over. – Sign Wagner to a 3 year deal, the first 2 guaranteed. These amounts were for the 2018 draft’s first round picks. Rousing discussion, Art. My own 1/50 of a dollar: If Mr. Wilson, Mr. Wagner, and Mr. Clark are all signed to contracts the size we now believe they could be, that’s 36+20+20…ish. 76 million to 3 guys, other contracts already in place, and a salary cap of just under 200 million. So…let RW play this year without negotiation. Make the best deal for Clark, even if it’s DeMarcus Lawrence money (say 20M/year, 65 guaranteed). Sign Wagner now at Von Miller money ($19M/year, 65 guaranteed). So your cap is okay this coming year. Next year, tag RW unless a deal is made because the cap will either go up or go away (due to CBA). Both this year and next year, draft a quarterback (like GB used to do). Tag RW again the year after that if you have to because the cap will go even higher. I know there are other players to deal with, but these are the most expensive, even with Tyler Lockett. The “trade them now” strategy is only good if we’re blowing it up, which we might do after Pete and John are gone in a few years, but not with them at the helm, right?